January 2015: ATF published a new, OMB approved Regulation Guide stripping AR-15 "green-tip" from its armor piercing exemption list. February 2015: ATF proposes a ban (which they've already put in place through their handbook published in January) on AR-15 "green-tip" ammunition and opens up a comment period. 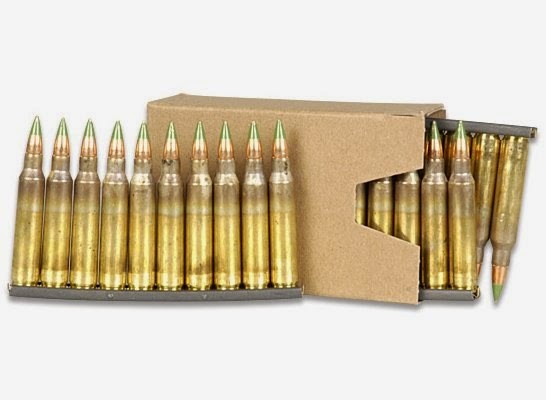 March 16, 2015: The comment period about the proposed/already implemented ban on AR-15 "green-tip" ammunition closes, ATF ignores tens-of-thousands of comments because they were never going to consider them in the first place, and continues with the regulations outlined in the new 2014 Regulation Guide. ATF changed the law unilaterally, didn't tell anyone about it and has now put up a bogus comment period that means nothing. Because of these actions, ATF and the White House have not only failed to follow the Administrative Procedure Act, but has gone around Congress to violate the Second Amendment rights of Americans. Even beyond the pre-publishing of the ban, it's Ol' Backwoods' view that M855 rounds were banned in practical reality the second the ATF put out the word that they were proposing a ban, and they knew it. The ATF knows, and know that we understand, they are so incredibly extra-constitutionally powerful,and that we have no effective redress of grievances, and therefore that we would react by a) 'civilians' buying up all available M855, and b) manufacturers and importers immediately stop making and importing it for 'civilian' use. I believe these reactions were anticipated, and are precisely what have happened. Rule #1 from Saul Alinsky's "Rules for Radicals". I think M855 is a test case for them, to see just how far they can take the banning of ammunition, as a gambit to destroy the 2nd Amendment. They know it will take years; they are prepared to wait. They believe they have the political power to continue this gambit as long as it takes. In my view, they believe they have a green light and a fast lane to an unconstitutional and dystopian future. UPDATE: the ATF calls their preannouncement of the M55 ban a "publishing mistake". Ol' Backwoods takes that to be bureaucratese for "Oh, crap, they actually read the documents and found us out? Who wades through all that bilge?" The 2nd Ain't a Right To Sporting Goods, People! In Which I AGREE With the Black Panthers?